It’s just before 5 p.m. on a Sunday, and people are starting to file into the former Curtis Lumber kitchen showroom in Burlington. After dumping their coats on chairs, many folks gravitate toward the coffee station at the back of the room. Those not needing a caffeine pick-me-up mill around and chat with friends. The crowd skews young and hip. Skinny jeans, beanies and trendy glasses abound. Some have inked-up arms and exotic piercings. In the far corner of the long room, musicians are tuning their instruments. A dreadlocked bass player plucks a few chords. A guitarist with a neo-lumberjack beard checks the mic. As the clock hits five, the crowd, many with mismatched coffee mugs in hand, slide into seats. Another bearded man with close-cropped brown hair, who seems almost impossibly cheery, stands to address the 50-odd people. “If you don’t know where you are or why you’re here, this is Dwell, and we’re a church,” he says. The keys hanging from his belt jangle softly as he speaks. It’s doubtful he needs to remind anyone where he or she is. The group — a de facto congregation — is there for spiritual nourishment. And this hip dude is here to feed them. The speaker is Zach Hoag, one of the founders of Dwell Missional Church, a relatively new evangelical community catering to Jesus’ skinny-jeaned followers. Of course, not all of Dwell’s members (called Dwellers) sport hoodies and Vans. But the overwhelming number of young creatives in the room suggests a new wave of evangelism — one rooted in the idea that God is loving and accepting rather than fearsome and judgmental, and one proffered by young pastors like Hoag. Dwell’s doctrinal underpinnings are so different from the cultural fire and brimstone of conservative Christian fundamentalism that Hoag doesn’t even like to use the word “evangelical” to describe them. While Dwell is evangelical in the purest sense of the word — devoted to scripture, specifically to the gospels — it has nothing in common with the red-state fundamentalism and cultural separatism that have come to define the movement today. In that way, Dwell belongs to a new breed of contemporary evangelical churches gaining traction around the country. Dwell got its start two years ago after Hoag, 31, his younger brother Nick and a few of their churchgoing friends realized that no spiritual community in the area truly spoke to them. Besides being passionate about scripture, the Hoag brothers and their friends had an interest in social justice and community building. They wanted a place where they could serve God and their neighbors. That group began meeting at a “crazy ghetto” storefront in the Old North End, Zach says. As word of Dwell gradually spread, they outgrew the space. The nascent congregation moved to the Free Methodist Church on Elmwood Avenue and remained there until this summer, when it relocated to new quarters on South Champlain Street. Dwell isn’t the only new church to pop up in Burlington in recent years. St. Andrew’s Christian Church, an evangelical, environmentalist community, worships at the First Baptist Church on St. Paul Street. Mosaic Burlington, another emergent Christian community, holds services in the Dwell space, which the Hoags have dubbed the Atmis Art Site. The red brick building that houses Dwell doesn’t look much like a church from the outside, or the inside. The industrial façade is characteristic of the many turn-of-the-last-century warehouses that populate the South End. The spacious interior features exposed beams and brickwork, as well as two electric fireplaces of late 1980s vintage — vestiges of the place’s recent incarnation as a showroom. But, once the chairs are arranged in pew fashion and Zach Hoag stands to speak, the space is every bit as churchlike as the stained-glass, pulpited versions. A recent Sunday service begins with a call to worship by a woman named Valerie. As she talks, the crowd nods along with her and utters the occasional “uh-huh.” When she finishes, Hoag takes the mic. Then Hoag asks the group to pray “real fast” before getting into the musical portion of the evening. The Dwell house band, called Queen City Lights, plays four original songs, which sound more like indie power-pop ballads than hymns. Those in attendance stand for the duration of the music, most swaying, clapping or snapping their fingers. Some are outright dancing. A woman with a tattoo of John 8:32 (“And ye shall know the truth. And the truth shall set you free”) grips her fiancé’s hand as they sing the lyrics projected on the screen at the front of the room. “My love is strong because we choose to belong to each other,” the congregation belts out in unison. After the music, Hoag opens the floor to any thoughts or prayers people might have. It’s like open-mic night, Christ-style. One woman asks people to pray she performs well on a test. Another requests prayers for a friend who was hit by a car. Still another woman thanks the Dwellers for praying for her during a recent health crisis and reports that she is doing well. As a minister, Zach Hoag is charismatic, charming and gentle. He’s like an indie-rock version of Jay Bakker, the punk preacher son of disgraced televangelist Jim Bakker. Hoag’s delivery is accessible — part standup comic, part popular teacher. From his perch on a tall bar chair in front of a sticker-covered MacBook, he cracks jokes about TV preachers and refers to Tom Selleck’s signature mustache when illustrating a point about Pentecost. This is what emergent churches such as Dwell are all about — meeting people, especially young people, where they are. That’s one reason Peggy Ramel attends Dwell. The 28-year-old Burlington woman wanted to be part of a progressive faith community that was more than just a droning, hourlong weekly service. She wanted a place where people felt compelled “to love others, to be actively engaged and involved in their surrounding community, to be mindful of how church funds were being spent and to be conscious of how their lifestyles impacted the environment,” she writes in an email. After her first Dwell service, Ramel knew she’d found the community she was searching for. The same was true for Dwellers Harold Vance and his wife, Nicole. The first Dwell event the Milton couple attended — an off-site meetup — felt like coming home, Harold recalls. Typically, these churches’ first two years are make-or-break. But Dwell seems to be sustaining itself, Hoag says. This is partly because its membership is growing, partly because the church is not the only tenant of the space. 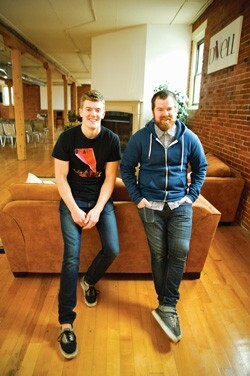 Nick Hoag, 27, along with Dwell cofounder Grant Stewart, recently began a boutique graphic-design business called the Future Forward with an office in the Atmis space. The firm manages the church’s slick website and has done design work for Zach Hoag’s other project, Burlington Freestyle, a secular snowboard-mentoring program. In that way, Dwell is different from the average evangelical community. You’d be hard-pressed to find a secular art gallery or theater space sharing turf with a Bible-thumping, divine-wrath-believing congregation. Like other accepting, affirming churches, Dwell aims to set itself apart from the loud and polarizing contingent in the evangelical movement. And its members are learning what shape that takes as it evolves.